The hyper minimalistic Xero Prio after three months and a lot of use. If you’ve read the title of this review, I know what you’re thinking right now. “Great, another company that says it does a minimalist shoe. Welcome to the club.” Yes, the word minimalist has been consistently diluted since the day Vibram released the Five Fingers, as every brand wants to offer something in the segment. Xero Shoes is one such company, but with an origin story of first building hyper-minimalistic sandals (which they still sell to this day), they bring some serious credibility to those who appreciate a shoe that truly focuses on the principle of “less is more”. Nowhere else is this manifested more clearly than in their new Prio shoe. Fit: Most important item first- the fit. Xero took a lot of elements we love in other shoes and melded them together in a refined up package. Being as minimalist as possible, the Prio of course features no drop from heel to toe and pairs it with a very wide toe box for ample toe splay room. With nothing but a small piece of tread between your feet and the ground, the weight of the Prio is at an absolute minimum. In fact, between that lack of weight and a fantastic fit, it’s easy to forget you’re actually wearing something on your feet during normal daily activity. A pair of men’s size 10 Prios weigh in at an almost laughably light 17 ounces. Durability: Xero claims their “FeelTrue” rubber compound used on their tread has a 5000 mile lifespan. Testing that thoroughly isn’t going to happen on our end, but Xero’s team has insisted that ultra-marathoners and cross-country walkers are still on their original pair of Xero sandles. More than that, Xero’s warranty also covers the Prio’s sole for 5,000 miles, so they definitely put their money where their mouth is. For the Prios specifically, though, the build of the shoe does indicate a product that was methodically built with high-quality materials. Most notable is the use of externally mounted straps to help adjust fit and hold everything in place. Does this mean the rest of the shoe will see a lifespan as long as sole? That remains to be seen, but after three months of heavy daily use, our Prios show no signs of the typical wear you would normally see, including loose stitching, seam fraying and areas of rubbing on the upper sole. Cost: The Prios will run you $89 on Xero’s website. The value aspect around a bare bones minimalist shoe can be debated all day long, but if the Prios do indeed last you for 5,000 miles, an $89 purchase price is the bargain of the century. Where To Use: “Feel The World” is one of Xero’s taglines and mantra, and that’s a good indicator of where you can and can’t use the Prios. For me personally, I have found the Prio to be downright fantastic for everyday use. Oddly, the place where I find it excels the most is at my office standup desk, where the zero drop and lack of cushioning help place a focus on proper body posture to compensate. 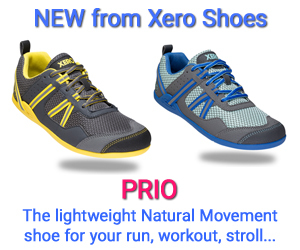 The Prios are also an ideal shoe for Crossfitters needing a wide, low, zero drop shoe. Road running is doable, but takes a particular focus on the right zero-drop running posture and avoidance of road debris, gravel and rocks. Trail Running: No dice. Xero wants you to “Feel The World” in your Prios, and on trails you do just that to a painful degree. I’ve always said technical trails are no places for minimalist shoes, and that opinion hasn’t changed after giving some local single track the Xero treatment. There’s just way too much trail feedback and painful foot placements when avoiding rocky or technical terrain isn’t an option. A stock photo of the Xero Prio, courtesy of the Xero website. Xero is an interesting brand. They have maintained a very strict focus on making products based around their design concepts seen in the original Xero minimalist sandal. Their team is also a great bunch of people who believe in their product more than any other company I’ve ever interacted with. More importantly, products of theirs like the Prios are, so far, very good. Only that those very good applications have come from places I didn’t expect. Places like acute feedback while pushing the gas and brake pedals in my car or standing at my desk all day at work. From a purely subjective point of view, I also think the aesthetics of the Prios are dead on. It’s a great looking shoe, and if it’s a shoe that is to be used daily and not just during exercising, then aesthetics become infinitely more important. I’m excited to keep wearing my pair of Prios. I’m excited to see just how long the shoes really do last under everyday usage. And I’m particularly excited to see what Xero is going to do next with their next generations of close-toed shoes. In the meantime, the Prios are a refined and worthwhile minimalist shoe in a space that is loaded with many options that are anything but. Chad Waite is the founder of Outdoor Gear Reviews and an avid outdoorsman and trail runner in beautiful Park City, Utah. ‹ Adidas Terrex Agravic GTX: How Does It Compare To The Flagship Skychaser GTX? OGR uses affiliate links to help pay for the cost of hosting these awesome reviews and posts. If you're looking to buy some gear, do it through our gear links and we'll get a kickback of your purchase to help our site stay live!